Laura Harms, the Zentangle Diva, posts a weekly challenge on her blog every Monday. I love reading the challenges and always hope that I can find time during the week to try them out. This week, she's celebrating something special, her Bi-zen-tennial! I had to do my part in getting 200 tiles shared on her page. The challenge included using your "mac-n-cheese" tangle (a familiar term for that tangle you love and always go back to) as a mono-tangle: the only tangle on the tile. She encouraged us to take it to the limit and work without a border, and of course, to include the number 200 somewhere. I continue to try to take risks and be innovative with familiar tangles. I've found, the more you work with them, the more magic just appears on the tile. I really like the one on the top right. 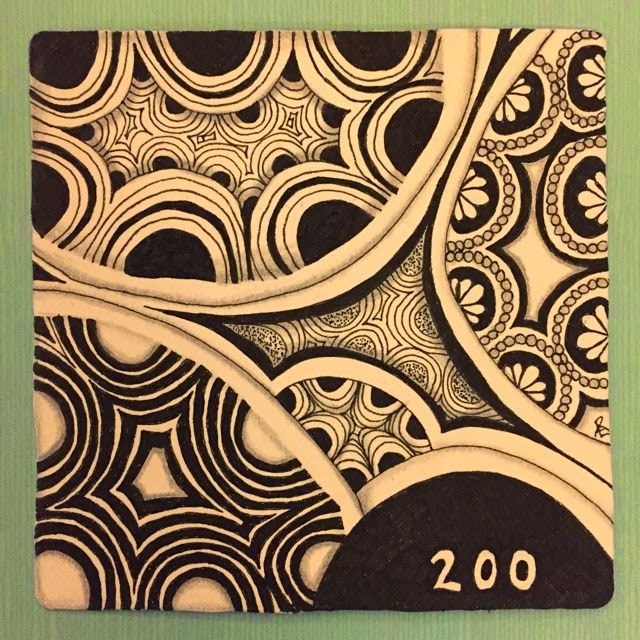 Congratulations and thanks to the Diva for gracing us with 200 weeks of Zentangle challenges!